Three sweet flowers dangle in a cluster from your ears reminding one of Lily of Valley. I created these earrings with 3 acrylic bell flowers dangling from copper kidney earwires. Super light in weight and measure 1 1/2 inches long. 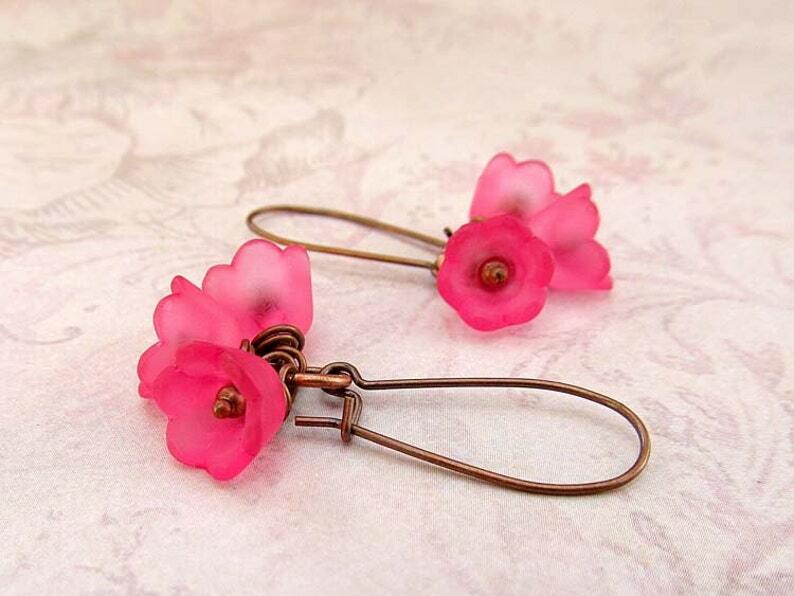 Perfect for bridesmaids earrings or just for casual fun! Lovely color, very dainty. Received very fast. Definitely someone to do future business with. From a repeat customer and friend, Gypsymoondesigns NEVER disappoints!! I love the care she provides with each item, and the protective and super fast shipping. Ready for gift giving! The delicate, beautiful, little pink cheerful flowers will be the perfect pick-me-up for my step-daughter new mom. Thank you, as always! I can always rely on the quality and creativity of your designs!